This has been a little late in posting. In truth I wanted to put some distance between me and Granada before I updated. I’m referring, in most part, to time passing and the ability to put my experiences in context. Then again if people don’t like what I have written then the geographic distance is no bad thing either. Relax, I’m not going to slag anybody off. Well not much anyway. Posted in honour of the anniversary of the Sandinista revolution which is currently being celebrated, most noticeably in Managua where free buses have been laid on for the thousands enjoying the party. While the current Sandinista government may split locals and expats alike it's worth remembering that the revolution was, at the time, almost universally backed. Whether you blame what went wrong on Daniel Ortega or Ronald Reagan is down to you. Join Empowerment International for an evening of Fundraising at Eurocafe for a Casino Night. All proceeds will go to EI's Nicaragua project. For the uninitiated that's Eurocafe, next to Hotel Colonial, in the Central Park area of Granada. Look out for Nicaragua and the Contras amongst all those Pirates and Emperors. It's an absolute must watch. Now this stuff is good. 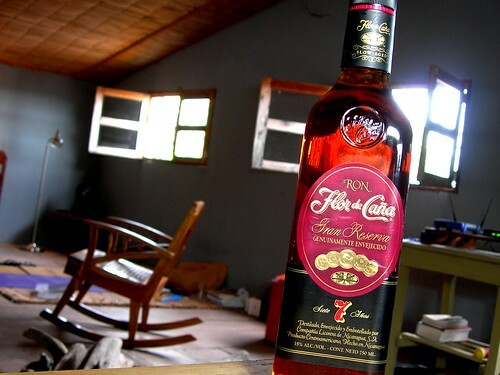 I was never much of a spirits drinker before but Nicaragua's Flora De Cana is universally loved by locals and gringos alike. I've yet to meet anyone who doesn't smack their lips at the very mention of the stuff. I've tried it numerous way. Personally it works best for me with a splash of soda and a twist of lime but it's good with ginger ale too. It's just so smooth - even neat it slips down without the slightest twinge. This particular bottle is for Vladimir whose had the thankless task of attempting to teach us Spanish. Ourwoman's good progress is testimony to his teaching ability, my slow progress is testimony to my linguistic failings. So why are we giving him presents? Well the lessons come to an end tomorrow as we prepare to head off. Yes, we're cutting our Nica adventure short. More info soon. Side note: If anyone is looking for a translator/guide/Spanish teacher then I can't praise Vladimir highly enough. If you want his email address then drop me a line. "Managua, Jul 5 (Prensa Latina) Nicaraguan Police and Army denied their responsibility for a cargo of weapons made in Israel, seized in Spain's Port Algeciras, with the Central American nation as final destination." As buzzing internet conversations have already deduced - if Israel is sending weapons then obviously they won't be for Danny and the Sandinistas. Israel is too close to America and as others have noted, aren't averse to doing a little dirty work on behalf of Uncle Sam. Could this really be a case of enemies arming anti-Sandinista forces? "Could they have been bound for some kind of neo-contra force? Talk about nostalgia for the '80s..."
"During the 1980s, Israel was a crucial conduit for the supply of arms to Central American contra forces, as well as to apartheid South Africa and Iran. With a Sandinista government installed in Nicaragua, and the ever present irritant that is Hugo Chavez, could this discovery be a sign of a new counter-revolutionary war?" It worries me and it's boosted my conspiracy paranoia. If that is what it is doing to me, then can you imagine what is going on in Ortega's head? "The shipment may have been meant to be discovered as a psyop against Commandante Daniel, to help push him to become repressive against his political opponents. If you read Spanish, you should look at the popular El Nuevo Diario (END)newspaper out of Managua: You should see the tremendously ugly hateful spleen launched there against Ortega on a practically daily basis, from the commentors on the different news articles. The hatred expressed is hardly equaled even in the free USA in alternative media commentaries and blogs about W. Daniel has got to be getting a bit wrankled by it all and arms headed for Nicaragua from Israel, making the world news, would add to it." Isn't that how it works now? Back your enemy into a corner. Scare him and when he comes out fighting, point the finger and tell the world he's a madman who needs to be brought to heel. One thing that has been bothering me for a while. Living in Nicaragua I am putting up with the almost daily electricity cuts. As I understand it, Ortega inherited the problem from his predecessor. Ever since his election we have repeatedly read of his attempts to solve the problem. Even if this man was as useless as his detractors claim him to be, surely we would have seen some improvement? So why is it only getting worse? "This may put into a new light the power crisis which is hitting Nicaraguans. “The crisis, worsened since mid-2006, stems from the poor condition of thermal plants, mostly in private hands, and obvious problems of distribution, in charge of Spanish multinational Union Fenosa.” Sabotage is a distinct possibility." You import guns. Even if the guns are for criminals rather than anti-government forces then it causes turbulence. You interrupt the electricity flow. In the Confessions of an Economic Hit Man, they talk of destabilising the country by sending in the CIA jackals. Then when crime is up, power and water cuts are frequent and the embattled leader is paranoid and defensive - you just let the media and the electorate do the rest. Sidenote: One of my favourite books of all time is A Very British Coup, it tells of a hard left Socialist becoming British Prime Minister and his attempts to stay in power as the CIA conspire to undermine him. What is the first thing they do? They get at the power workers Union which strikes and out go the lights. And that is exactly what I think of every time it's my lights that go. US based website Overseas Property Mall seem a little confused about Nicaragua. "Nicaragua No Longer Land of Sandinistas and Somozas but a Real Estate Opportunity"
I guess they haven't bothered to research who the current government are. Strangely, this scene came to my mind this morning as I was attacked by a dozen mosquitoes while sat on the toilet. I feel your pain Kong. "July month of Sandinistas partying, during this month in every Nicaraguan department a celebration takes place, in reminiscence of their liberation. "These activities start on July 15th and finishes on the 19th day of the Sandinista Revolution, where the most important gathering takes place in Managua, on this day or the day before caravans of vehicles rally from all over the country. "Be advised that this year celebrations will NOT be as in early years (al suave), with Sandinistas running the government, they will sure become more expressives. "PCVs or Trainees are not allowed to go near, participate in parties or gatherings related to these celebrations."